I currently work at The University of Manchester in the UK as a ‘Scientific Applications Support Specialist’. In recent years, I have noticed a steady increase in the use of open source software for both teaching and research – something that I regard as a Good Thing. Even though Manchester has, what I believe is, a world-class site licensed software portfolio, researchers, lecturers and students often prefer open source solutions for all sorts of reasons. For example, researchers at Manchester can use MATLAB while they are associated with the University but their right to do so ceases as soon as they leave. If all of your research code is in the form of MATLAB and Simulink models, you had better hope that your next employer or school has the requisite licenses. This summer, a few people in the Control Systems Centre of Manchester’s Electrical and Electronic Engineering department asked the question ‘Is it possible to implement all of the simple MATLAB/Simulink examples we use in a second year undergraduate introduction to Control Theory using free software?’ In particular, they chose the programs Scilab and Xcos. Since the aim of this course is to teach control theory principles rather than any particular software solution, it would ideally be software agnostic. Students aren’t asked to develop models, they are just asked to play with pre-packaged models in order to improve their understanding of the material. Student intern Danail Stoychev was tasked with attempting to port all of the examples from the course and in fairly short order he determined that the answer to their question was a resounding ‘Yes’. Part of the exercise set for the students is to define all of the relevant parameters in the workspace: b,a,k and so on. If you attempt to download and run the above, you’ll have to do that in order to make them work. You’ll also need extract and plot the results from the workspace. It can be seen that the two models look very similar and, for these examples at least, it really doesn’t matter which piece of software the students use. 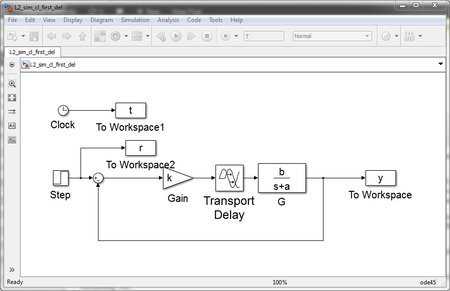 Simulink from The Mathworks is widely used in various disciplines. I was recently asked to come up with a list of alternative products, both free and commercial. Wolfram SystemModeler – Very new commercial product from the makers of Mathematica. Click here for Wolfram’s take on why their product is the best. 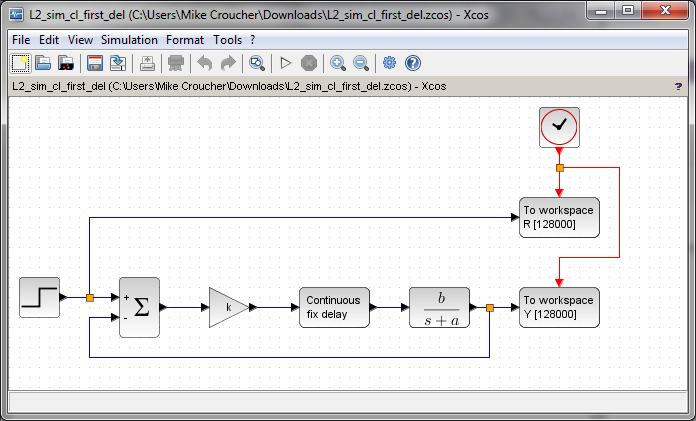 xcos – This free Simulink alternative comes with Scilab. I plan to keep this list updated and, eventually, include more details. Comments, suggestions and links to comparison articles are very welcome. If you have taught a course using one of these alternatives and have experiences to share, please let me know. Similarly for anyone who was switched (or attempted to switch) their research from Simulink. Either comment to this post or contact me directly. I’ve nothing against Simulink but would like to get a handle on what else is out there.